Cyrano – Outshining his own legend. My sister’s first book was published a few weeks ago but I only got hold of it last monday when Amazon finally sent me the copies I’d ordered. (Hopefully this means they are selling it so fast they didn’t have enough of them.) Although I had been awaiting the arrival of her book for several years, it was surprising to be finally holding an actual genuine real-life book in my hands (well, three books in fact, you wouldn’t just buy one would you?). Almost as a consequence of following the long process of research, writing, re-writing and editing that went into it, I have trouble believing that it is really here and that it looks just like a real book right through from ISBN to index, and having all the features one would expect from book published by Simon & Schuster. From the colourful and elegant flysheet with it’s equally elegant author’s photo, it took a little getting used to the fact that this tangible hardback in my hands was the final version, the first edition. Ishbel had succeeded, you could tell because her name was there in gold lettering along its spine (but not thankfully embossed in gold on the cover!) It even managed to strike the right balance between accessible and academic, it had pictures and jokes, a bibliography and plenty of precise little footnotes. Seeing all of that I was very impressed, very proud and of course very slightly jealous. Well, then I started reading it and it’s even better than in looks. I’ll need another whole post to review it properly and even then I warn you that you can’t easily summarize the highlights of such a meticulously planned and researched book. But in case you hadn’t heard of C d B, he was a gay atheist sword-fighting sci-fi poet living in Paris in the mid seventeenth century. He was a freethinker who feared nothing and laughed at everything, and largely got away with it, perhaps in part due to his fearsome reputation as a duellist. To say he did not take himself seriously would be an understatement and yet he was scrupulous in avoiding taking patronage or conforming to the expectations of social advancement. It must be difficult to write the biography of someone who is liberal (and libertine) with his own history and who’s work was generally too controversial to be published in his lifetime. The problem that is doubled by the large shadow cast by the fictionalized Cyrano de Bergerac familiar from Edmumd Rostand’s phenomenally successful play. 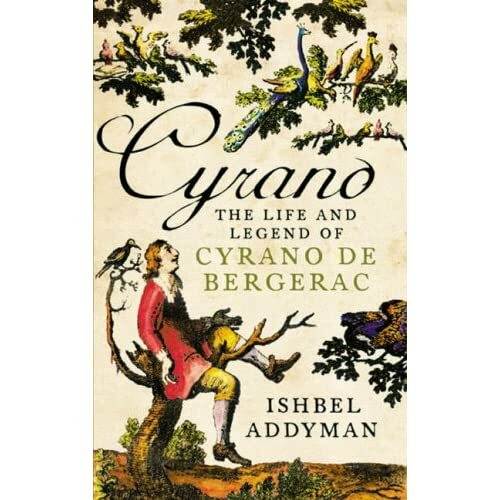 Ishbel manages to tell all the versions of his life and legend of clearly and objectively and makes a very strong case that the real Cyrano was a much more interesting character. Especially given the time he was living in when heretics and freethinkers faced a very real threat from the Inquisition and the State. I’m not really doing it justice but here are a couple of proper reviews from the Spectator and the Literary Review. Inspired by the book, I just tried to rent the Oscar-winning Jose Ferrer film version from 1950 but lovefilm actually sent me the Cannes Grand Prix winning Gerard Depardieu version. I guess I’ll get to see both. But like book says remember that the real Cyrano is better than the imagined. Get your copy now, only £8.49 at Amazon. Oh and yes, he really did fight off a hundred men single handedly. This entry was posted in words and tagged Amazon, Cyrano de Bergerac, equally elegant author, GBP, Gerard Depardieu, Paris, sword-fighting sci-fi poet, the Cannes, the Literary Review, the Oscar. Bookmark the permalink.